Last year Jason and I read about the township of Rural, in Wisconsin near Waupaca, and had to check it out. It's a very small area, 5-6 streets of old (1800's) restored homes and out buildings. The buildings are labeled with a family name and the date of construction. The area is very serene and tranquil. We fell in love with the old homes and all the history attached to them. This year I took the rest of the family there. The town is just a few minutes from where we stay, so it's an easy drive out there. As we were on our way back to the cottage I saw a "home for sale" sign. Always curious, I drove up the street. The house wasn't too impressive to me but the cemetary was. The kids and I (and my parents, sister, and her kids) found gravestones that were about 150 years old .. perhaps not a big deal to most people, but nothing in south Florida is that old (at least not so you'd know it!). 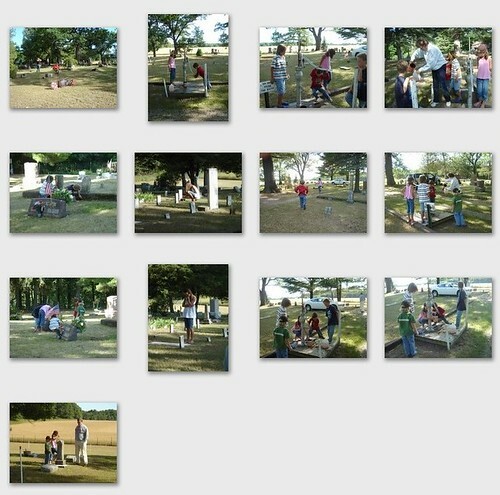 It was very saddening to see how many of the gravestones were for very young children, which of course led to discussions about health and why people live longer now. We also came across a well. My kids had never seen a well and were thrilled to learn that after it was primed it really produced water. The water wasn't potable so they used the water to water plants near the graves. I'd love to post a link or two to Rural, but I couldn't find any. Next year I guess I'll take a few pictures of the town!